Until recently, I had only ever heard one record from the ARCO song-poem label, but it was such a winner, that I made Arco one of the labels I routinely search for. And I finally came up with a record by the same group of artists that made the initial record that I like so much. Making it more difficult is the fact that there have been at least two other labels called "Arco" over the years, both of them unrelated to the song-poem game. 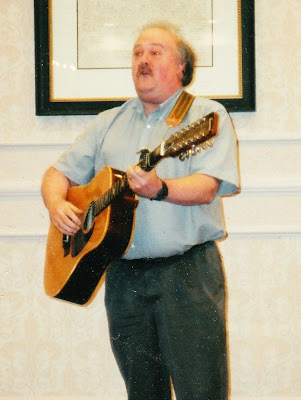 There is little information about the Arco song-poem label at the Song-Poem archives website. Before the site was mothballed, the only information available had indicated that it was associated with the Globe family of labels, no doubt because of one Kris Arden record which had been found on Arco. My new find suggests another link, between Arco and the Sterling label and/or the Preview label, as the name of Lew Tobin, a significant name in both of those labels' histories, shows up on this disk. 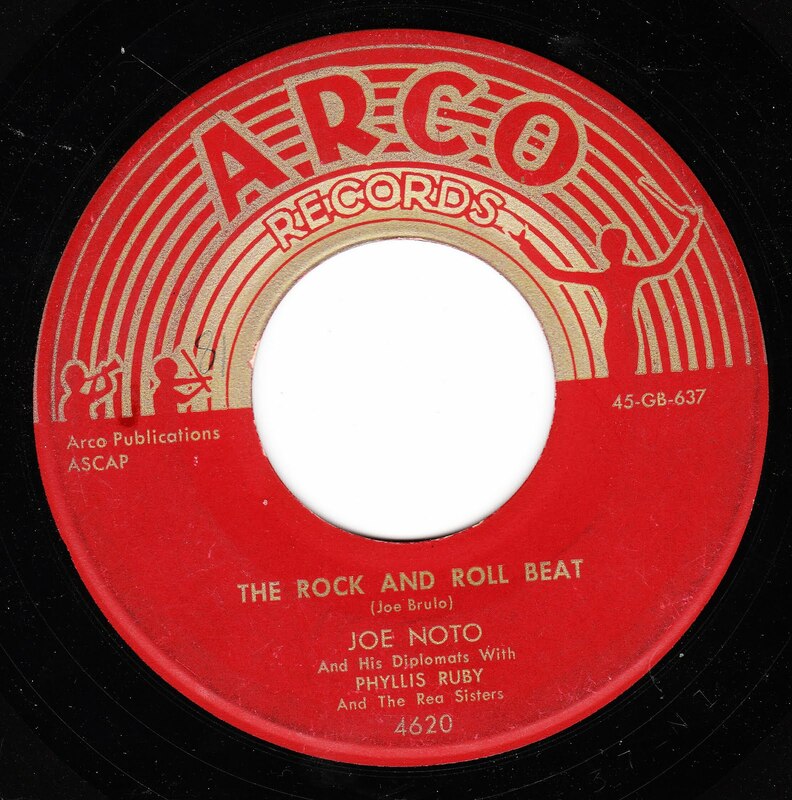 First off, today, I'm featuring the record I recently bought, which features the clunky billing of "Joe Noto and His Diplomats with Phyllis Ruby and the Rea Sisters". 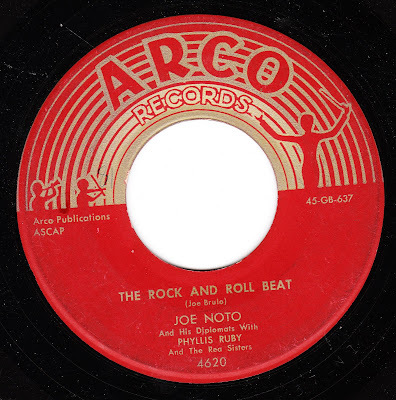 While it's not quite as good as the first Arco record I heard (which is posted, below), "The Rock and Roll Beat" has a lot to offer, including some genuinely good musicianship - I love the three part harmonies - combined with some iffy lyrical choices, and an interesting match of words about Rock and Roll combined with an arrangement which (outside of the solo section) only seems to be marginally related to rock and roll. And now, for a bonus. I've shied away from featuring songs on this blog that I don't actually own on the original records, but having brought up my reasons for wanting to own more Arco records, I thought I should share that first Arco record I heard. 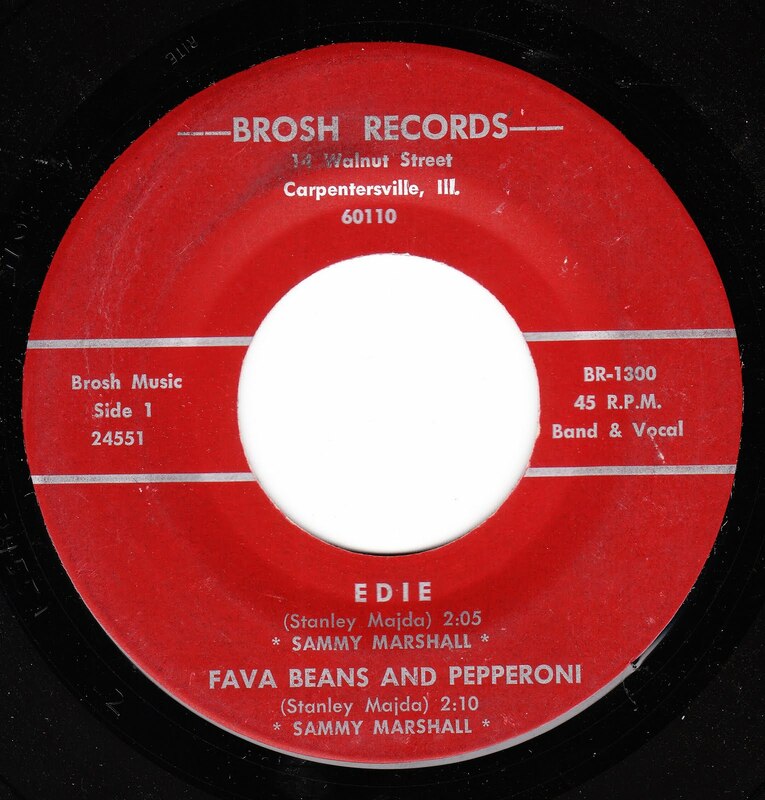 Because I don't own this record, I cannot share a JPG of the labels. 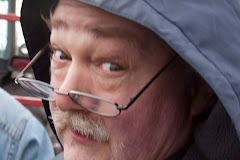 This was shared with me, along with many other song-poems from the most offbeat corners of the genre, to my eternal gratitude, by a huge song poem collector in New York, with whom I exchanged MP3's, many years ago. Thank you, again, Michael. 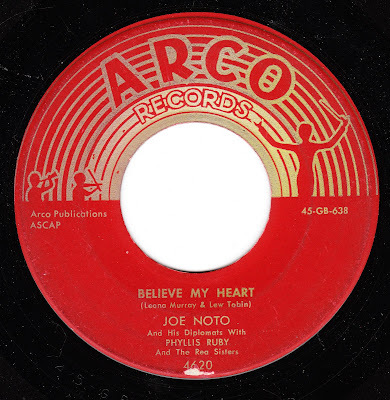 The song in question is "My Lover", again by Joe Noto and Phyllis Ruby. This is first-rate stuff, a great set of words, a creative arrangement for the vocal section, a wonderfully peculiar vocal, and a completely unexpected moment in the middle of the record. The flip side of this record is another really fun one, "Mr. Dee-Di-Jay", by Nancy Jordan and the Blue Rockets. The Brosh label is a mystery to me. There are only a handful of known releases, almost all of them bearing label numbers ending in "00", and the label's tracks are a mish-mash of songs produced by other song-poem factories, particularly Globe, Halmark and the labels produced by Lee Hudson. There were also some releases that were either legitimate or vanity products. 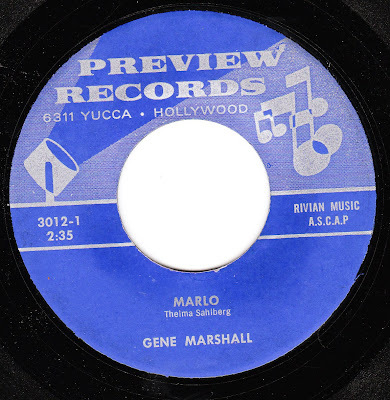 There are other labels like this - several of them, actually - but in almost every case, by looking at the songwriters of the various releases, you can quickly get the name or names of the person or people behind the label. Not so with Brosh - there are almost as many different songwriters as there are sides to singles. Aside from a couple of records by Judy Jae, today's offering may be the most notorious Brosh release. It's an EP combining two songs from the Globe song-poem factory with another two songs from the Halmark label. The real attraction for me, though, is on the b-side. 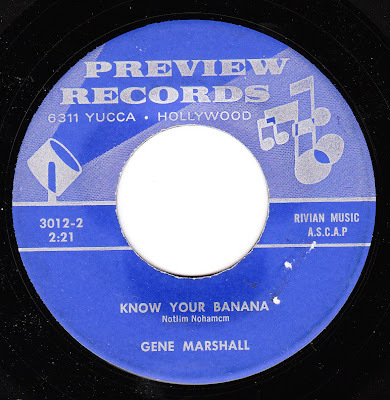 Both of these songs were also released on a Halmark 45, where they were attributed to the correct singer, the always astonishing Bob Storm. 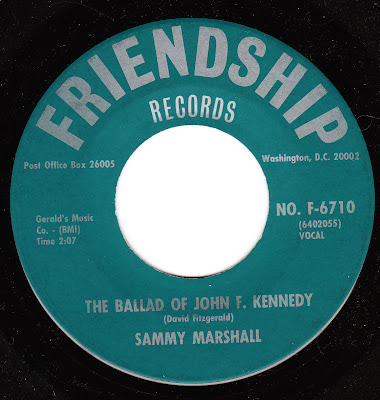 For the Brosh copy, no doubt due to some breakdown in communication, both songs were attributed to "Jerry Dee", whose only other song-poem credit was a listing as the "Musical Director" on many of Halmark's 45's. That would be a dubious credit indeed, since nearly all of Halmark's backing tracks were old tapes purchased, ready-made and already recorded, a system which would rule out the need for a musical director. 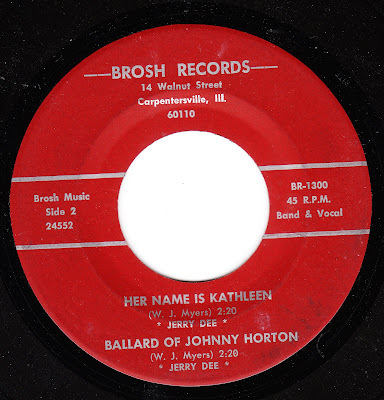 Finally, the star of our show, a little ditty titled "The Ballad of Johnny Horton", or, as you may notice, looking at the scan of the label, Brosh accidentally re-titled it "The Ballard of Johnny Horton". This song uses the same backing track as did the mind-numbing "Let's Lay It On the Line", a song which could not be less similar, in terms of lyrics. Enjoy! My goal for this site has always been to share some of the recordings I love and find fascinating with whoever might share some of my taste. I've rarely used it to share my own songs and recordings, as that wasn't really my intent in starting this site. Today, though, I'm making an exception. This is my 50th birthday, and I'm taking this opportunity to celebrate myself and some of the music I’ve made in the last 30 years or so. I hope that those of you who regularly listen to the song-poems and other music that I share will have a listen to some or all of these songs. I would love to hear any comments that you’d care to offer. Since around age 18, I've been writing songs both serious and humorous. I’ll include a handful of each type here. If a few are not really your speed, please try out a few of the others - my songs cover a lot of different genres. Unless otherwise noted, these are one-man-band-and-vocals performances. Those previous two songs both began as dreams, where I heard a key moment of the song as I woke up, and both benefit in their keyboard solo sections, from the then newly recent influence of Rodd Keith's records. 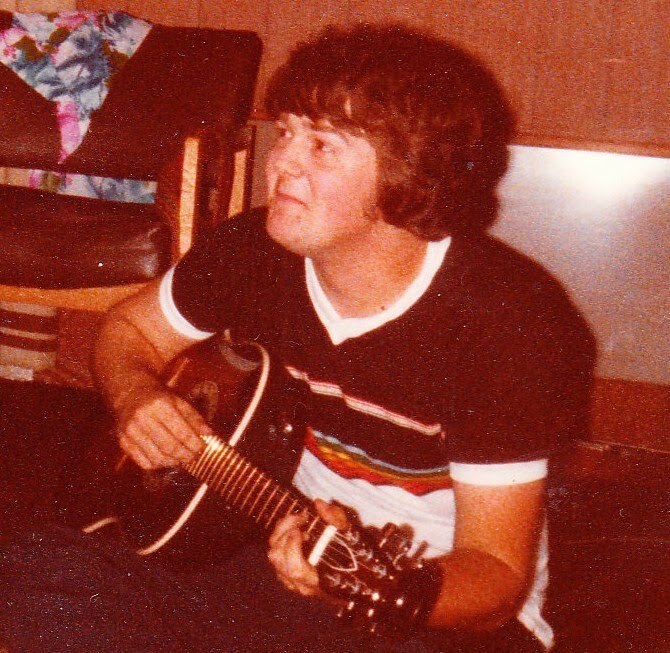 Thanks to all of you who read this blog, and I hope you enjoyed the music I’ve shared today. I have a whole pile of singles ready to digitize sitting here, generally stacked in the order in which I plan to share them in this venue. But every now and then, I acquire a new record which immediately goes to the top of the pile - everything else can wait. I've never felt the need to delay the other records more than I did when I heard today's offering, a Gene Marshall number on the Preview label, which I obtained earlier this month. 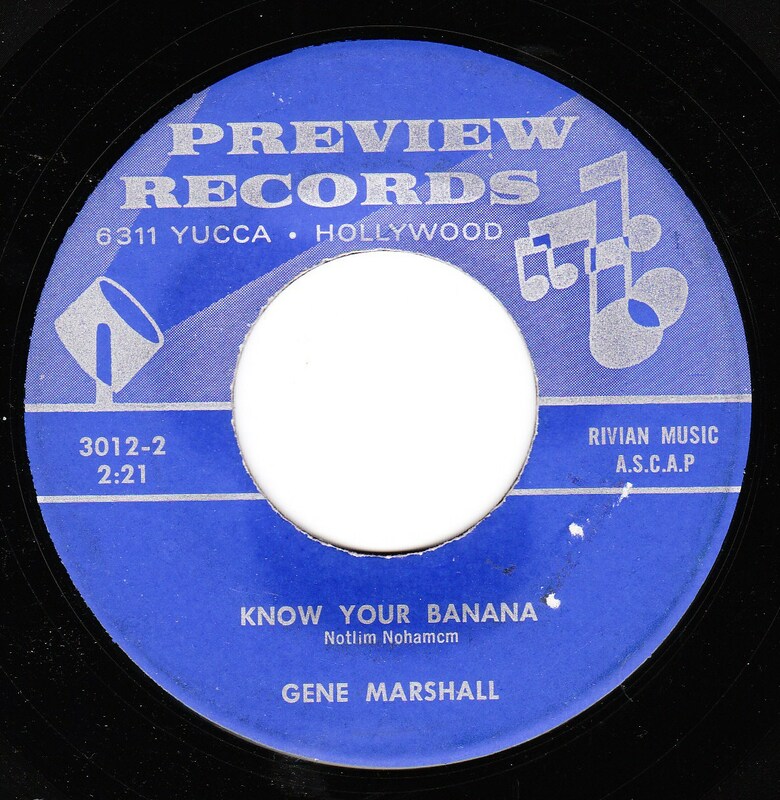 The title, "Know Your Banana", was great enough, but I have to say I haven't ever heard a Preview record that sounds remotely like this one, or a Gene Marshall vocal similar to this one, either. And the songwriter even submitted his name backwards, as it is listed as Notlim Nohamcm. It sounds like everyone involved was having a great deal of fun, and if song-poem compilations were still being produced, I'm sure this would be a prime contender. I think that's all I'll say - it's best that the listener experience this one for him or herself. 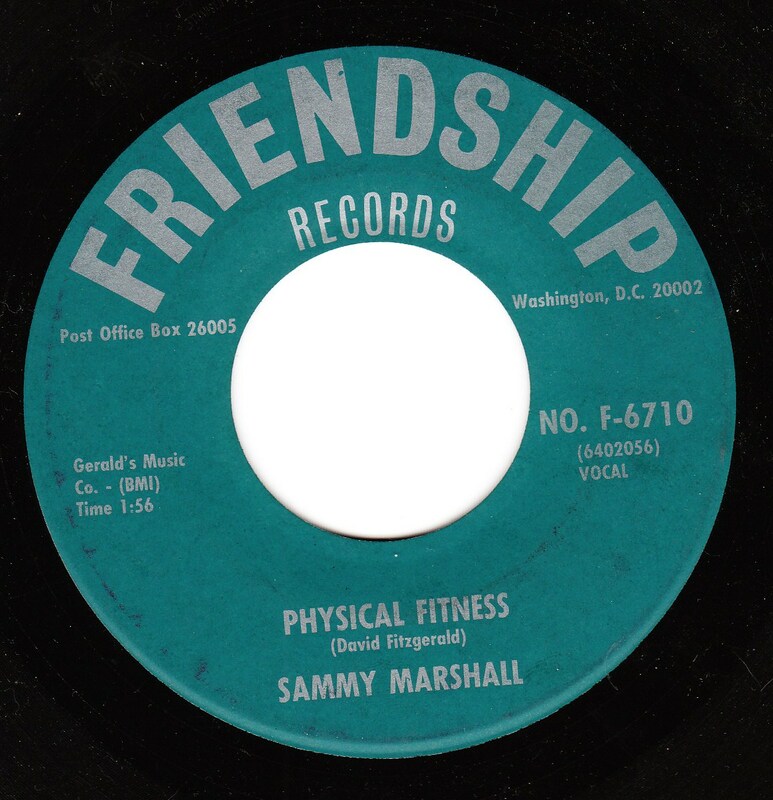 Today's offering appears to have been inspired both by John F. Kennedy's promotion of Physical Fitness, and by his tragic death. Song-poet David Fitzgerald supplied the lyrics to both sides of the single, which are dutifully handled by song-poem hero Sammy Marshall. My favorite part of the A-side, "The Ballad of John F. Kennedy", is the part where I believe (it's sort of a muddy recording) the words refer to JFK as "Our Modern Moses"! 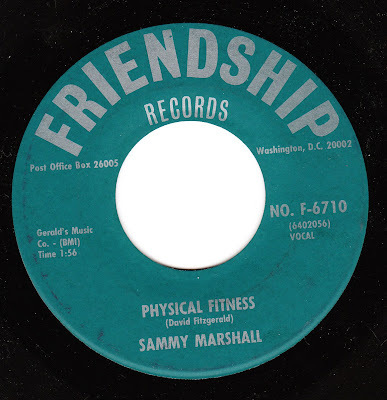 The B-side, appropriately more peppy than the maudlin A-side, is "Physical Fitness". I'm happy to hear that even if, during Mr. Fitzgerald's daily five o'clock exersize, his bone "cracks", he won't turn back. Now that's dedication! A quick link which might be of interest to song-poem fans of a certain stripe. My most recent post to WFMU features 12 songs (6 45's) from the Fable label. This is one of my favorite labels, and it often released song-poems. As I wrote in the post, a few of those records I posted there might be song-poems, but I'm betting most or all are not. On the other hand, they are quirky records in the same way that many of the best song poems (especially 1950's song-poems) can be, and you might enjoy them as much as I do.